Nope, 26 references from the booth during a Sunday Night Football game in which he didn't play was not enough to sate the football-broadcasting world's need for Peyton Manning in their lives. "I'm doing well, Vern. I get to do a little more each week. Taking it slow. Following doctor's orders. It's tough. I was telling my minister the other day at bible study, it's kind of like I've been giving the sermon for 14 years and now I'm passing out the bulletins." Laughter ensues, until the realization by all that passing out the bulletins does not have the same impact on services as preaching, but it's still better — as Vern pointed out — than passing out the collection plate! LSU's up 24-7 seven minutes into the quarter. 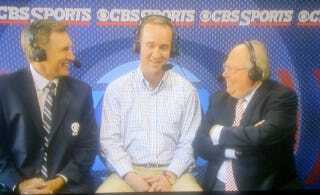 Manning's just leaving the booth.